In this edition of our Long Range Forecast, we're taking at a look at Christmas Day's wide releases for what will be the final weekend of 2013. - The fifth pairing of Scorsese and DiCaprio should have wide appeal after their immense success over the past decade. - Leo's success from Django Unchained and The Great Gatsby is likely to carry over here. - In the wake of Thor: The Dark World, The Hunger Games: Catching Fire, and The Hobbit: The Desolation of Smaug, older audiences will likely gravitate toward a more adult-oriented picture. - The ensemble cast will widen the potential appeal of the film thanks to Matthew McConaughey and Jonah Hill in potential Oscar attention-grabbing roles. - Should awards buzz follow, look for a healthy run after an already solid opening weekend. - Will audiences be interested in seeing a 1990s-set movie about a crooked Wall Street banker? - The apparent "sleaze" of Leo's leading character could be off-putting for general audience consumption. - The crowded Christmas/New Year's marketplace. - Ben Stiller is a considerable draw, especially during the holidays, thanks to the Meet the Parents and Night at the Museum franchises. - Stiller has had a successful directing career with the likes of Tropic Thunder, Zoolander, and The Cable Guy. - Fantastical dramas tend to play well during the holiday season. - Early reviews don't indicate as much Oscar potential as once thought, which could hamper the film if audiences don't take to it. - Stiller is, respectably, stepping outside his directorial wheelhouse with this dramedy. - The crowded holiday marketplace. - The notion of seeing an aged Rocky Balboa and Jake La Motta in Stallone and De Niro could whet the appetites of older crowds during the holidays. - Director Peter Segal has a strong track record with past hits like Get Smart, The Longest Yard, 50 First Dates, Anger Management, The Nutty Professor II, and Tommy Boy. 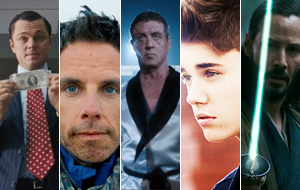 - Neither Stallone nor De Niro are reliable box office draws on their own these days. - Will audiences want to watch two old guys slug it out in the middle of a packed marketplace? - Justin Bieber's rabid fan base. - Bieber previously sent his Never Say Never documentary to an impressive $73 million domestic haul. - Has Bieber's reign atop popular culture started to fade? He's certainly been on the receiving end of plenty of bad publicity lately. - Stylized action fans haven't had much to choose from lately. - Keanu Reeves gives the film some needed recognizable star power. - Reeves hasn't been a reliable box office draw in years. - The film will very likely be overshadowed by other holiday releases. I want to tell you that how to connect the Bluetooth audio device. You check this http://fixwindows10connections.com connections and I am sure that your connection established.